From the eclectic metropolis of Toronto in the East to the multi-cultural vibrancy of Vancouver in the West, this thorough tour that spans the width of Canada’s wondrous landscape invites you to marvel at the natural and historical splendour dotted across a trail that showcases the best of old and new world Canada. Ascend the CN Tower for glorious panoramic views of the city of Toronto. Witness the breathtaking views over the rushing waters of Niagara Falls. See the splendour of Garibaldi Park from above on a unique floatplane tour. Travel over the surface of the ancient Athabasca Glacier expanse in an Ice Explorer. Discover the beautiful floral designs of the Butchart Gardens in Vancouver. Arrive in Toronto and transfer to your downtown hotel, where after checking in you can spend the rest of the day exploring the streets and vibrant neighbourhoods of the eclectic city. Be sure to take a rise to the peak of the CN Tower for a breathtaking panoramic view of the city below. Spend breakfast getting to know your fellow travellers before delving into the metropolitan city of Toronto and discovering several of its landmarks, such as the Waterfront, Chinatown and the Provincial Parliament sector. Depart the city afterwards and head to the Niagara Peninsula, through the Victorian town of Niagara-On-The-Lake on to Niagara Falls where you can marvel at the rushing waters as they cascade to the foot off the falls. Depart Toronto in the morning and head eastward towards Ottawa, passing through farmland and following the Rideau Waterway’s rivers and lakes. 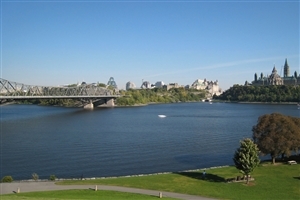 On arrival, you can embark on a tour of the national capital of Ottawa, a place of outstanding beauty and culture, where you will see the Byward Market, City Hall, and the public gardens. Head out along the Ottawa River today over to the French-Canadian province of Quebec, skirting the magnificent Laurentians and follow the Chemin du Roy past Quebecois villages and historic shrines. 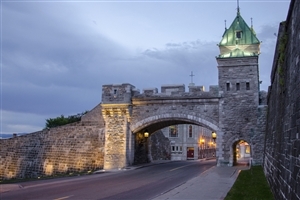 On arrival of Quebec City you will be taken on a tour within the city walls, past the intricate city gates, through Lower Town, The Citadel and Battlements Park. Spend the day at your leisure, further exploring the interesting World Heritage Site. Take an optional day tour to Tadoussac which includes whale watching on the St. Lawrence River aboard a boat. You will also have the chance to visit the Montmorency Falls which stand 30 metres taller than Niagara Falls. The remainder of the day is yours to do with what you wish, explore the winding streets and quaint boutiques or dine in one of the eateries. Leave Quebec City and drive along the St. Lawrence River along the trail of the early settlers. Upon arrival in Montreal, tour the second-largest French-speaking city in the world. The dynamic city of Montreal encapsulates the two founding cultures of Canada and embraces the best of both history and modernity. Touring the downtown area we view the Olympic Complex, Mcgill University, colonial Old Montreal, the residential streets of Mount Royal and the lively shopping streets. In the evening, take an optional dining excursion and experience 'Montreal by Night' - a scenic trip out on the town to one of the city's best known Greek restaurants. Journey on back to Toronto to once again immerse yourself in the vibrancy of the varying districts filled with entertainment and dining options. Take the opportunity to relax aboard a cruise through the stunning 1000 Islands. 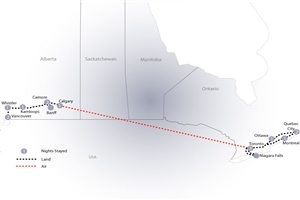 Catch a flight today from Toronto airport, over the prairie grain fields to Calgary where upon arrival you will make your way to your downtown hotel. Start out early for a morning tour of Calgary. 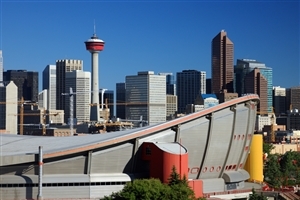 Visit a number of historic and modern landmarks such as Calgary Tower, Fort Calgary and the skyscrapers of the commercial district. From Calgary you will next be heading for the Canadian Rocky Mountains, first seen along the distant horizon. The majestic mountain range frames the scene perfectly as you discover Banff National Park. Tour the region within Banff amidst snowy peaks, pristine glaciers and emerald green lakes as well as landmarks Bow falls and Tunnel Mountain. All of today will be spent at your leisure as you accommodate yourself with Banff, including the numerous boutiques and shops that line Banff Avenue. Take an optional tour of the Columbia Icefield which begins with a visit to the renowned glacier of Lake Louise partly immersed in the lake’s aquamarine waters. Continue on to the rugged lands of the Icefields Parkway. Embark on an optional excursion in a helicopter ride to see the Three sisters Mountains. Board an Ice Explorer on arrival at the Columbia Icefield that will take you across the icy surface of the ancient Athabasca Glacier. You will return to Banff in the late afternoon to unwind from the day. Traverse the renowned Trans-Canada Highway, following the footsteps of the railroad engineers of the mid 1800s. Cross the jagged Kicking Horse Pass into British Columbia's Yoho National Park. The highway itself offers a beautiful display of a variety of landscapes as they bleed into one another, from vast icefields, dense forests, deep canyons and glacier-fed streams. Continue on through the Monashee and Selkirk mountain ranges to the rugged interior town of Kamloops for your overnight stay. View the changing of the landscape as you drive from the ranch lands and on to the coastal mountains. Take a thrilling optional floatplane tour over Garibaldi Park for a unique perspective of the natural beauty of alpine lakes, volcanic peaks, and open meadows. Spend the remainder of the day at your leisure. Proceed south along the Sea-to-Sky Highway through the extravagant landscape of serrated fjords and snow-capped mountain peaks. The countryside slowly ebbs as the cityscape of Vancouver comes into view. 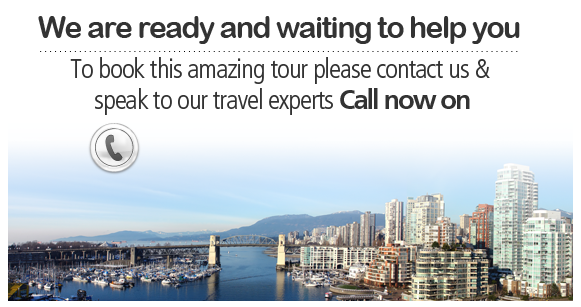 On arrival you will be taken on a sightseeing tour featuring local highlights such as Stanley Park, English Bay, Gastown, Prospect Point and Chinatown. The afternoon is yours to discover other sights or peruse the shops and eateries of the bustling streets of Granville and Arbutus. Enjoy a beautiful day at leisure as you embrace the vibrant ambiance felt through the streets of Vancouver. For a real treat, why not check out the market places of Granville Island with spectacular views, stroll the trails of Stanley Park, or sit atop a beached log on English Bay as you look out over the calm waters. For the adventurer, perhaps journey up to the summit of Grouse Mountain on a gondola. An optional day tour is on offer to Victoria, the charming provincial capital that is proud of her maritime heritage. See the stunning 19th century landmarks and enjoy the buzzing atmosphere. Before taking the ferry back to Vancouver, you will peruse the Butchart gardens, one of the world's great floral displays set in a reclaimed stone quarry. Spend the last minutes of your tour shopping or relaxing before transferring to Vancouver airport for your return flight home.